Take Apart Wooden Block Fire Engine is a wonderful red fire engine which can be taken apart into 5 separate block pieces including the base. 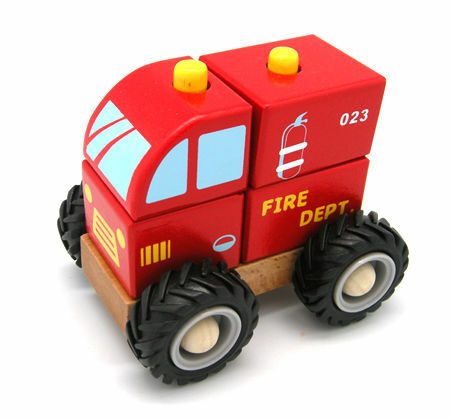 This wooden Fire Engine is very well made and the perfect size for small hands. The wheels are rubber so they are strong and won't scratch or make a lot of noise on a hard floor. This little truck is rated for 18 months plus. This stacking toy is very well thought through. Now you can un-stack your fire truck drive it around and then rebuild it and drive it somewhere else. Size: 11 x 11 x 9cm wide ( perfect for small hands). Material: Wood with child safe paint, rubber wheels. We like this because: "Great combination of stacker and truck."